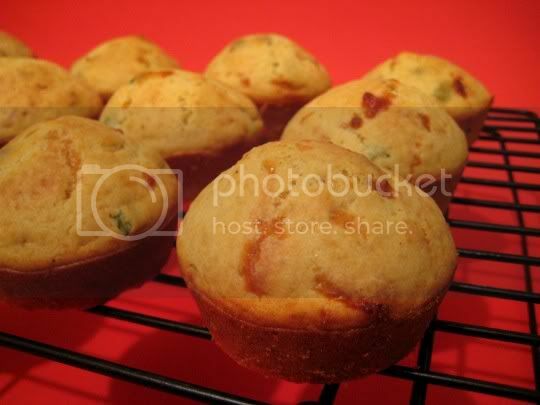 ALMOST as good as the infamous Red Lobster cheddar biscuits, these savory muffins are super easy to make and super delicious! Crispy on the outside and smooth and moist on the inside (hmm, almost biscuit-like texture), the flavor of these muffins are subtle, but you can taste every bit of cheese (mozzarella, Romano, and Parmesan), pungent onions, spiciness of black pepper, and just a tad of nutmeg. The pairing of nutmeg with cheese is always a winning combination, and although only a dash is used in the batter, it seems to enhance the saltiness and nuttiness of the cheeses. These are amazing served warm fresh out of the oven, alongside soups, stews, chilis, tomato-based sauces, whatever! I didn't make these into the "jumbo" version as the recipe is called, but a regular-sized dozen was just as good. Make again? Yes. Quick and easy, great for serving!